Hals was the first Master of the Dutch Golden Age of painting and his creative energy and vivacious character depictions played an incredibly important role in the evolution of portraiture as a genre. Instead of conforming to contemporary notions of beauty or stereotypical appearances, Hals subjects have clearly differentiated faces that are unique and lifelike in appearance and his sitters are often portrayed in relaxed poses and situations, engaging with those around them instead of gazing directly at the viewer. This approach to portraiture was new and Hals's work spawned many imitators in his own period and many of his approaches were adopted as part of wider movements in Dutch art. His ideas also saw something of a revival in the nineteenth century, with his paintings influencing both the subject matter and the stylistic approach of the Impressionists. The smile is the hallmark of many of Hals images, ranging from a glimmer in the eye to a broad grin and this was unusual at a period when sitters were traditionally depicted with their mouths closed and with a serious expression. Hals represented laughter deftly and his figures are more animated and consequently more human than those produced by many of his contemporaries. Hals inverted compositional norms by utilizing a huge variety of poses for the people he painted and this was at odds with the stiff and formal poses seen elsewhere. This was particularly novel in his group works such as The Banquet of the Officers of the Civic Guard of St George (1616) where he banished monotonous regularity with techniques including grouping the figures rather than placing them at equidistant intervals, incorporating individual gestures, and varying the direction of the gaze of the sitters. Hals' brush strokes were both visible and prominent and this created a rough textured appearance to his work. Most paintings of the period were carefully smoothed and finished and this contrast added to the vitality of Hals pieces giving them a unique sense of life and movement. Frans Hals was born in either 1582 or 1583 in Antwerp to Franchois Fransz Hals van Mechelen, a cloth merchant, and Adraentje von Geertenryck. Antwerp was at that time part of the Spanish Netherlands and during the Fall of Antwerp a couple of years later (1584-1585) Hals' family fled to Haarlem in the Dutch Republic. Frans had two brothers, Dirck and Joost, both of whom also went on to become painters, although none of Joost's work survives today (he died before 1626). Even though Hals and his parents were Catholics, Dirck was baptized in Haarlem in the Protestant faith. This large-scale work was Hals's first of three paintings for the St. George civic guard in Haarlem. It shows the officers at their farewell banquet having just ended their three-year tenure. Their seating arrangement reflects their ranks, with the colonel and the provost at the head of the table on the left. The middle is occupied by the three captains whilst the three lieutenants sit at the end. The three men standing, who wear the company's red and white sashes, are ensigns, each of whom carries a flag. The central flag is that of Spain, a trophy from the Spanish occupation of Haarlem which ended in 1580, the other two flags are red and white, the colors of St George as well as the City of Haarlem. The figure standing at the back without a sash and carrying a plate is their servant. Group portraits such as this (called shuttersstukken), were popular in the 17th-century Netherlands and were often commissioned by civic organisations such as guilds, militias and charities to mark notable events. They were highly representative works where much emphasis was placed on detail in clothing, emblems and decoration. The group would decide collectively on the format of the work and then each member would sit separately to have their likeness painted. They also split the cost of the commission, albeit not equally but according to their rank. Painting a shuttersstuk would have brought the artist a good income for up to a year and often led to further commissions by individual group members. In Hals's case, the success of this work led to two more group portraits for the militia of St. George (1627 and 1639) as well several more portraits of the sitters and their families. The overall composition of the painting is modelled on Cornelis van Haarlem's group portrait of the St. George's militia from 1599. Van Haarlem's painting, however, is much more static and formal than Hals's interpretation. Hals's painting shows each member of the militia in a slightly different position, some looking at the viewers while others are engaged in conversation. Their highly individualized portraits are full of character and the entire composition is kept dynamic through varying hand gestures and postures. The fact that Hals was himself a member of the same militia company may have enabled him to convincingly convey the subtleties of the group. The bodies of the men form a circular shape around the table, which leads the eye around, causing the viewer to note and acknowledge each of the sitters individually. It is highly likely that Hals's more dynamic approach to group portraiture influenced later group works such as Rembrandt's The Night Watch (1642). In addition to the figures in the painting, Hals demonstrates his talent in still life. In particular the luxuriously decked table shows off his ability to convey minute detail, down to the figurative pattern on the white table cloth, reminiscent of Early Netherlandish painting. He also displays a mastery in textures, showing off elaborate folds and various fabrics in the company's clothing and room decorations, as well as metal plates and glasses as part of the banquet. This double portrait was probably painted to commemorate the marriage of Isaac Abrahamsz Massa and Beatrix van der Laen in 1622. Isaac, a wealthy merchant, and Beatrix, the daughter of a regent, belonged to the educated elite of Haarlem and this wealth is reflected in their expensive and fashionable clothing. The portrait was highly unusual at this period due its relaxed poses and expressions and outdoor location which was at odds with the formal, carefully posed paintings usually commissioned to celebrate a marriage. The two sitters sprawl on a seat beneath a tree, their bodies and clothing hanging loose. Instead of looking respectfully at her husband, Beatrix's arm rests casually and proprietorially on his shoulder and they both smile knowingly at the viewer. This open body language and the sitters' direct, friendly gazes give the picture a strong sense of intimacy rarely present in other works of the time. The painting is filled with symbolism surrounding love; apart from their physical proximity and ease, Isaac's gesture of resting his right hand on his heart suggests his commitment to their new union. To the left of the couple grows an eryngium thistle, a Dutch symbol for male fidelity, and the ivy on the tree behind the couple stands for eternity, attachment and fertility. The background scene offers further hints towards the romantic meaning of the painting, with two couples strolling through a garden of love. There are also a pair of peacocks, an animal often associated with paradise and eternity. Whilst landscape backdrops were not entirely unusual in 17th-century portraiture, the couple's position so close to nature is a divergence from the more usual settings of formal interiors or plain backgrounds. Yonker Ramp and His Sweetheart shows a young man and woman in a tavern. He is raising a glass flask into the air and looks up, his mouth open in a smile, whilst a dog rests its head in his left hand. The woman is leaning on the man's shoulders, smiling and looking directly at the viewer. Behind them a half-opened curtain reveals another room. This is the only surviving work by Hals that is dated with an inscription on the canvas. The current title was given to the piece in the 18th century with Yonker or Jonker meaning "young gentleman". The woman, however, rather than being his lover, is more likely to be a prostitute. While it has been suggested that the young man and woman are portraits of actual people, it is more probable they were models drawn from Hals's everyday life such as family members or pupils. Here Hals shows the subjects of his painting outside of the usual boundaries of comportment, drinking, laughing, and with ruddy cheeks and noses. The meaning of the painting has been the subject of long debates among art historians and it has been suggested that the piece carries a moral message about the perils of excess and this was not unusual in genre pieces of the period. Wilhelm von Bode in 1909 was the first to directly associate it with the biblical story of the Prodigal Son (Luke 15:11-32) and although it is possible that contemporary viewers would have recognized the likeness of the squandering Old Testament figure in the young man, there is little evidence to support this reading. Regardless of the painting's intended meaning the image offers a glimpse into everyday life in 17th-century Haarlem. Unlike many contemporary works that show portraits of sitters represented in an idealized way, this work appears to encapsulate a more genuine representation of people at the time. This approach of showing mundane, real-life scenes became an important part of 19th-century painting, shown in the works of Manet and Degas, amongst others, who depicted scenes of anonymous people in bars and cafes. This colorful work shows a man in a jester's costume and hat playing a lute. He is depicted in half-length and has his head turned to the left, looking upwards and smiling at someone or something outside the frame of the portrait. The musician is caught in time in the middle of playing a tune, as emphasized by the man's slight turn of his head and body, and the position of his fingers. His hair is slightly unkempt and it is realist details such as this that sets Hals' work apart from other notable portrait painters of the period such as Rembrandt and Van Dyck. Hals almost certainly painted this image from life and it has been suggested that the same model in this work appears in other Hals paintings such as his Yonker Ramp and His Sweetheart (1623). The theme of the lute player painted in half-length originated in Italy and was introduced to the Northern Netherlands by Dutch painter Dirck van Baburen in 1622. This indicates that Hals was aware of current ideas in the wider art world and he went onto paint two further images of lute players, The Fingernail Test (1626) and Boy with a Glass and a Lute (1626). The influence of these images on other artists can be seen in similar works by Hendrik ter Brugghen and Jan Steen. Stylistically, the portrait is an excellent example of Hals's talent to apply bold brush strokes to create an expressive image full of life and character. It is painted "wet-on-wet", rapidly applying fresh oil paint on top of still wet paint, thus mixing and blending the colors to create dynamic transitions. 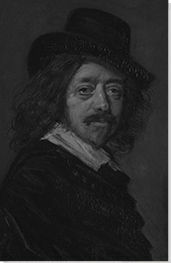 One of Hals's most famous works, this portrait shows a man with a distinctive moustache, dressed in very fashionable clothing. Confidently resting his left hand on his hip, his gaze is directed at the viewer and he smiles ever so slightly. An inscription in the top right corner of the picture reads tells us the sitter was 26 years old in the year 1624, when the work was painted. The current title of the work comes from Victorian England, when the work was exhibited at Bethnal Green Museum in 1872-75. Although the subject of the painting is not a cavalier, the name underlines the joviality and feeling of confidence radiating from the sitter's eyes. It is not known who is depicted in this work, Pieter Biesboer has suggested he could be Tieleman Roosterman, a cloth merchant from Haarlem, whom Hals painted in another portrait in 1634. Other theories identify him as a member of a military association. Either way, his clothing shows that he certainly moved within the social elite of the time. In particular his sleeve with its slashed upper arm and intricate lace cuff is extremely elaborate. The silk embroidery includes symbols of courtship such as lover's knots, bees and arrows, as well as a pyramid and obelisk, which stand for strength. Due to these emblems, it has been suggested that the painting was commissioned to celebrate the sitter's wedding. This would indicate that there would have been a female pendant portrait but no work has so far been identified as the matching counterpart. Despite appearing very detailed, the intricate sections are nonetheless painted in Hals's usual speedy manner. The lace in particular is executed in an almost sketch-like style. 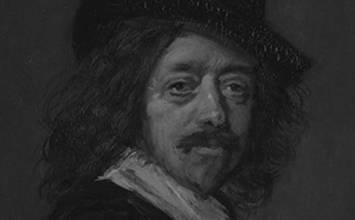 Hals also shows off his skill in monochrome painting, skilfully rendering the black sash and broad-brimmed hat, as well as the white lace collar with very few brush strokes and a limited range of colors. Hals's loose painting technique together with the sitter's voluminous clothing, casual body language and friendly facial expression give the painting a relaxed air and sense of dynamism. Despite its great attention to detail and sumptuous textures, it appears light and fluid, whilst at the same time conveying great realism. It is through this that the painting is given an almost photographic quality, especially when viewed from afar. Another one of Hals's genre paintings, this work depicts a young man in a grey cloak and red feathered hat, holding a skull in his left hand. His right hand gestures towards his viewer and his mouth is slightly opened as if he is speaking. The meaning of this work is a matter of debate. Whilst the motif of a boy holding a skull was a common one in the Netherlands from the 16th century onwards, here the boy's clothing is reminiscent of theatrical performances but also of allegorical works by the so-called Caravaggisti, an Utrecht-based school following the style of Caravaggio. It has therefore been suggested, most notably by art historian Seymour Slive in 1989, that Hals's work is a vanitas piece, denoting the transience of life symbolized by the skull. This view has, however, been debated by Frans-Willem Korsten in 2016, who interprets the pose as a snapshot of a theatrical performance, referring to the boy's dramatic hand gesture and animated gaze to the side as being very different to other vanitas depictions. One popular interpretation is that the boy can by identified as Hamlet holding the skull of Yorick. This unusual portrait shows a woman sitting at a table in front of a dark background, with a beer jug in her right hand and an owl on her left shoulder. Her head and gaze are turned to her left and she is laughing. She is plainly dressed in a brown dress with a white collar and coif. The work's title derives from an inscription found on the back of the painting that was added in the late 17th or early 18th century. Malle in Dutch means crazy and Babbe is a diminutive of Barbara. It is believed that the subject of the painting was a real citizen of Haarlem, who likely suffered from a mental illness. Research has revealed that she was housed at a local mental hospital called Het Dolhuys just outside the city walls, where Hals's son Pieter was also a resident. The work has also been titled The Witch of Haarlem due to the association of the owl with witchcraft practises. However, it is more feasible that this painting is another one of Hals's genre-works. Often set in inns and pubs, these works frequently include references to Dutch proverbs. The owl in this case would therefore allude to the saying "drunk as an owl". It is possible that the painting is an exploration of mental illness and it certainly invokes in the viewer a sense of unease about the sitter's insanity and unpredictability. This is emphasized even more by the rapid execution of the work which gives it a stark immediacy that is almost threatening. The fact that she is shown in an unidentifiable setting underlines her isolation and makes her laughter contribute to the sense of insanity rather than a humorous reaction. Malle Babbe is one of Hals's boldest works, painted rapidly with short, thick brush strokes and with a very limited range of colors. It inspired a number of other similar paintings such the Metropolitan Museum's Malle Babbe from the later 17th century that has been attributed to a pupil or follower of Hals. During the 19th century the subject of "the mad woman" was popular and can be found among the works of Théodore Géricault and Eugène Delacroix, as well as by the early 20th-century artist Chaim Soutine. In 1869 Gustav Courbet created a copy of Hals's painting. He signed the work both with his own name as well as with that of Hals himself, a homage to the old master and recognition of his influence on art 200 years after his death.